The admission to PhD Program (Part Time/Full Time) will be strictly as per Institute rules. The admission will be done in the following departments. 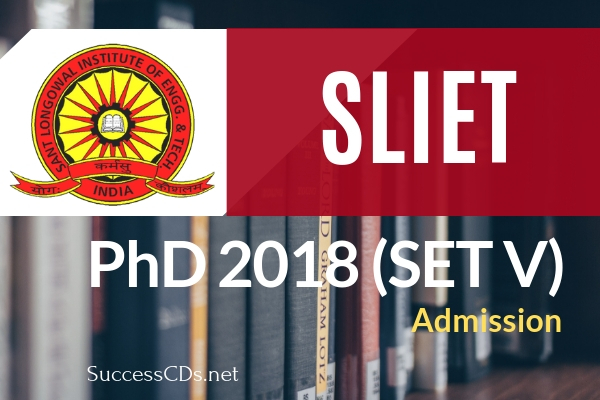 Candidates wish to apply for the PhD Program at Sant Longowal Institute of Engineering and Technology (SLIET) can get the details on dates, eligibility selection, application and more from the page below. Sant Longowal Institute of Engineering & Technology (SLIET), established by the Government of India, provides technical education in emerging areas of Engineering & Technology. The Institute offers programs at Certificate, Diploma, Degree, Post-graduate (M. Tech., MBA and M.Sc.) and Ph.D. level in Science, Humanities, Management, Engineering and Technology. The M. Tech. Programs were started in the Institute in 2002. The admission to Ph.D. Program (Full Time/ Part Time) will be strictly as per institute rules. The admission will be done in the following disciplines. Master’s Degree in Engineering / Technology / Science / Humanities / Management with 55% marks (50% for reserved categories) in relevant disciplines (MCA degree is not eligible for Ph.D.in CSE). (i) Master’s Degree holders or a professional degree declared equivalent to the Master’s degree by the corresponding statutory regulatory body, with at least 55% marks in aggregate or its equivalent grade 'B' in the UGC 7-point scale (or an equivalent grade in a point scale wherever grading system is followed) or an equivalent degree from a foreign educational Institution accredited by an Assessment and Accreditation Agency which is approved, recognized or authorized by an authority, established or incorporated under a law in its home country or any other statutory authority in that country for the purpose of assessing, accrediting or assuring quality and standards of educational institutions. a) Based on number of candidates to be called for interview, Dept. can set a higher cut off marks. b) The PhD Entrance Test (SET-V) will consist of one paper of two hours duration. This paper will have 100 objective type questions (Multiple Choice) of total 100 marks. c) the proposed area of research can contribute to new/additional knowledge. The eligible candidates who have qualified GATE/ UGC/CSIR (JRF) NET with fellowship/ NET (ASRB) with fellowship/ State level eligibility test (SLET/SET) with fellowship (having valid score) are exempted from appearing for the entrance exam, However, they will submit the proof of having qualified the exam with valid score. But, they have to APPLY ONLINE. These candidates have to appear for the interview/presentation/viva voce. A few seats are also available under Full time without Fellowship and Part Time category in all the departments subject to recommendation of DRC.